HENDERSON COUNTY, N.C. — Stephanie Jones and her husband David Parnell were doing fairly well as a young couple with a newborn boy. Mom and Dad each brought home a paycheck. That made for a happy life for the young family in the lush, rolling landscape of Henderson County. But that changed when, at age 2, their son was diagnosed with autism. Finding day care for him was all but impossible, and the added burden of taking him to five therapy sessions a week forced Stephanie to become a stay-at-home mother. And, of course, it dramatically reduced their income. David continued working as a machine operator at Wilsonart Engineered Surfaces, a manufacturer of laminates. He works a swing shift – a week and a half of nights, then a day off – though he usually opts to work on his day off – followed by a week and a half of daytime work. Then he gets five days off. “It’s been a lot of hard work” for both of them, Stephanie says without a trace of self-pity. But things are looking up for the family. On July 27, 2017, as intermittent rain threatened, a small gathering of Henderson County Habitat for Humanity officers and executives with the local branch of the State Employees Credit Union dedicated a tidy new three-bedroom, two bath home in Dodd Meadows. It’s one of the 161 homes that will ultimately comprise this Habitat neighborhood. 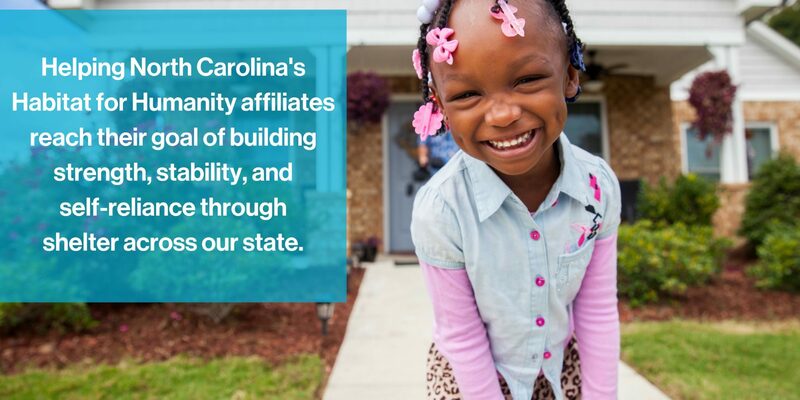 The home is one of 102 that will be built in the SECU Foundation’s Mountains-to-the-Sea Challenge, an ambitious program to build a Habitat home in each of North Carolina’s 100 counties – plus a few extra. The Foundation has put up $10 million to fund the challenge. Once the home is built, the new homeowners assume a no-interest mortgage through SECU, which then returns the funds to the Habitat affiliate so that another home can be built. The Foundation is funded by the $1 monthly maintenance fee that each SECU member pays. “That dollar goes toward a lot of things,” said Amanda Reid of the SECU, including college scholarships to graduates of area high schools and to Blue Ridge Community College in Flat Rock. 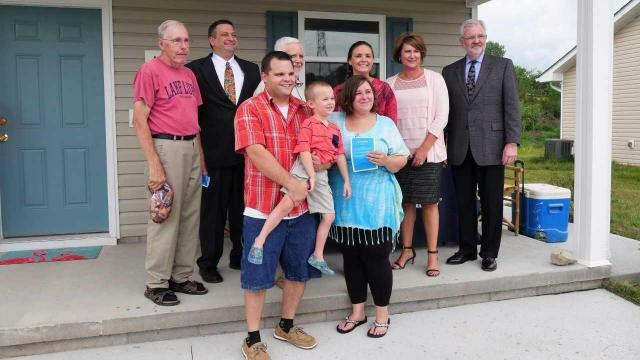 David Parnell and Stephanie Jones with their son at the dedication of their new home in Henderson County. But for the Jones-Parnell family, the SECU Challenge brought a unique opportunity to build a foundation of financial security by securing the great American dream of owning a home. To get there, they put in 400 hours of “sweat equity” on their home. That, along with the help of Habitat volunteers, makes the mortgage affordable to a young family of modest means. It also allows Habitat to build energy efficiency into the home that keeps month-to-month living expenses low. Alan Stissel, director of construction services for the Henderson affiliate, speaks with satisfaction of the home’s efficiency. It will have an average monthly power bill of $31. Nothing especially exotic is done to achieve that, Stissel said. The attic is insulated with 8 to 10 inches of foam around the roof beams, which provides much higher insulation than 14 inches of more traditional batting. The air-conditioning unit and water heater are put in that cooler space. Habitat Hendersonville also uses architectural shingles on this and other homes, which have a higher insulation value and can last twice as long as cheaper shingles – making it well worth the 25-percent-higher up-front cost. All of that planning is designed to allow a family to get into and keep a home of their own. And the importance of that cannot be overstated, said Ron Laughter, president and CEO of the Henderson Habitat affiliate.